For years, my favorite room decoration was a copy of the original album sleeve unfolded and tacked to my wall. A rolling piano riff to start Ain’t Wastin’ Time No More, accentuated by classic Allman Brothers slide guitar licks. The harmonics at the end of Little Martha, a Duane Allman composition. I think of these lovely harmonics, the final notes on the last album of his life, as his musical angel wings. Maybe that’s corny, but, well … yeah it’s corny. I don’t have a defense. The album opens with Ain’t Wastin’ Time No More, a Gregg Allman composition recorded in the studio after Duane’s death. Those slide guitar licks, always the definitive sound of the band, are played by Betts on this song, as Duane–the more famous guitarist in general, but especially for his slide playing–was already gone. The nine-minute Dickey Betts guitar instrumental Les Brers in A Minor follows. Betts may be the less well-known of the Allman Brothers’ guitarists, but some of the band’s best known instrumental compositions are actually his, including In Memory of Elizabeth Reed and Jessica. The last song on the first side of the record is the radio staple Melissa. It’s a beautiful song of wandering the road and longing for home that’s similar, to me at least, to the Rolling Stones’ Wild Horses. Gregg Allman wrote Melissa several years before, but this version was recorded in 1972 and included on the album because Duane, now gone, had said it was one of his favorite songs. I agree: I like this song so much that I made it an important element in the novel I wrote for my MFA thesis. Just the other day I was on a crowded subway platform waiting for the 8 a.m. train to take me to work, and I heard a busker singing it from somewhere at the other end of the station. For the briefest moment, I ceased to be depressed about my morning commute, and I found myself singing along: “Again the morning comes/Again she’s on the run…” Did I get weird looks from people? Probably. Did I care? No. Side 3 of the original LP opens with another live track, a cover of blues legends Elmore James and Sonny Boy Williamson that became one of the band’s best known songs: One Way Out. It starts with Betts playing a boogie riff, which Duane Allman comes over the top of with a vicious slide riff. The lyrics are self-explanatory: “Ain’t but one way out babe/Lord I just can’t go out the door/Cause there’s a man down there, might be your man I don’t know.” If there’s one thing the blues knows about, it’s infidelity. Of course, the defining quality of this track is the guitar solos: Betts goes first, and it is not an exaggeration to say his guitar roars; then Betts and Duane trade licks over a clapping audience, before Duane launches into his own solo. This song rocks so hard that, as I sort of said in my first Epic Road Trip recap, it might be the best driving song in the universe. Next is Trouble No More, another live outtake from At Fillmore East. It’s a cover of a Muddy Waters blues song, and also one the Allmans recorded in the studio for their debut album. Next is the Dickey Betts song Blue Sky. Betts wrote the song about his then-girlfriend, Sandy “Bluesky” Wabegijig (she was Native American), and it is the first time he performed as the band’s lead vocalist. It’s my favorite song on this album, my favorite song by this band, and one of my five favorite songs of all time. It opens with a clean, pretty guitar riff, and then simple lyrics about walking along a river with the love of your life. The title appears in the chorus: “You’re my blue sky/You’re my sunny day/Lord, you know it makes me high/When you turn your love my way.” The next three minutes are made up of an extended guitar instrumental: Duane comes first, with rapid fire notes that seem to climb toward the clouds; Betts joins as the two play a quick melodic line together, and then he takes his own long solo, ending in an unmistakably “Allman Brothers” repeating riff before he sings the second verse and chorus. This song makes me so happy, you could play it 10o times on repeat, and I’d still be smiling and dancing on number 101. I literally cannot get tired of it. The album closes with the gorgeous Little Martha, Duane’s acoustic instrumental. Duane wrote the song himself and performed it as a duet with Betts. As with In Memory of Elizabeth Reed, the name for the song was taken from a tombstone in the Macon, Georgia cemetery where the Allmans used to hang out. It’s an interesting guitar composition, played fingerstyle, with both guitars tuned to open-E. There’s so much great guitar work in the Allman Brothers catalog, but ever since I looked up the tab for this song, I’ve always found this piece to be the most impressive. Famed guitar instrumentalist Leo Kottke called it “the most perfect guitar song ever written.” Seeing as how it was recorded just a few weeks before Duane’s death, I like to think he left a bit of his soul behind in it. But then, isn’t that what any great musician wants to do in all of his work? The most famous track is definitely One Way Out, and Mountain Jam is emblematic of the epic live performances the Allmans were known for. But the biggest reason this album has to be on my Desert Island list is Blue Sky. One of my rules for the Desert Island game is that you can’t use live albums, since they often function as de facto greatest hits collections. 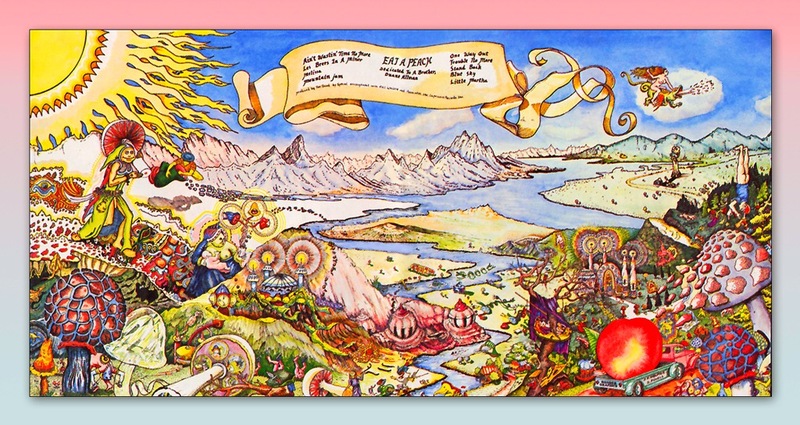 Eat a Peach kinda sorta breaks that rule, with One Way Out and Mountain Jam, but because of the way the album came together, following Duane’s death, I give it an exemption. Because of the circumstances surrounding its recording, it’s a mixed-up, somewhat incongruous album, but the songs on it are so awesome that it just doesn’t matter. I often say that, as a guitar player, if I could pick one band to go back and time and be a part of, it would be the Allman Brothers. The mix of country, blues, and pop that they helped forge into what became known as Southern rock is home to some of my favorite tones in the rock ‘n’ roll soundscape. I would have loved to be on stage playing a one of those long guitar solos on Mountain Jam or One Way Out or Blue Sky, and if I’m going to be stranded in a lonely, eternal exile, I’ll need those epic jams to help me pass the time. 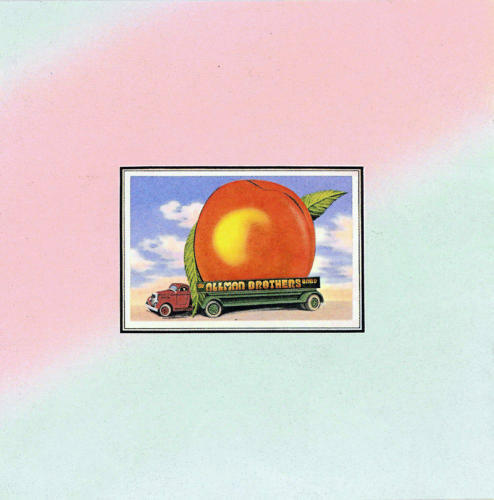 This entry was posted in Desert Island Albums, Music and tagged Allman Brothers Band, desert island albums, Dickey Betts, Duane Allman, Eat a Peach, music, Southern Rock. Bookmark the permalink.